I'm too excited, I can't wait any longer - I'm starting my postcard giveaway! I've been waiting for my Postcrossing sent postcards (which really means registered postcards) to hit 500. I'm still at 498, but I'm starting the giveaway anyway! Here's the catch: the giveaway will be closed when I announce hitting 500 postcards, or on Tuesday, August 30 at 12pm EST - whichever comes SECOND. I realize that it's possible that 2 of my traveling postcards could be registered in the next day, which really wouldn't give folks much time to enter... so if you're thinking of entering, enter now! If I hit 500 before Tuesday, August 30 at 12pm, I'll keep the giveaway open until then. If Tuesday, August 30 at 12pm comes and I still haven't hit 500... then the giveaway is open until I do. But what am I giving away, you ask? I'm offering 5 of my new postcards from my etsy shop. The winner can pick any combination of the designs listed above: all of one, 5 different, whatever. I will ship these anywhere in the world, so this giveaway is open to all locations. 1. HOW: To enter the giveaway, leave a comment on this post. One comment/entry per person, please. 2. WHO: No anonymous comments will be approved. You need a blogger profile to enter this giveaway (simply because I need to know who you are - I'm not going to count through "anonymous #7"), and if you don't have a blogger profile yet, just make one. It's fast, easy and free, doesn't require a blog, and I think only requires a valid email address. Also, your profile with email address MUST be viewable, or you must provide a valid email address in your comment. If your name is drawn as the winner, and I don't have or can't access an email address for you, I'll choose another winner. (Don't be an Indigo.) Either 1) you have an email address or a blog of your own accessible on your blogger profile, which I am allowed to view; or 2) you leave an email address in your comment. If your comment/entry doesn't fall into one of those categories, it won't even get approved, lest it throw the numbers off for the random number generator when I do the final pick. Lastly, keep your eyes peeled for this magical phrase after you submit your comment/entry: "Comments will be visible after blog owner approval." If you miss that and comment twice, or three times, or more, I'll delete duplicates. 3. WHERE: No location restrictions this time. I'm going to open this one up to anyone, anywhere in the world. 4. WHEN: The deadline for comments/entries is no earlier than Tuesday, August 30 at 12pm EST... but possibly later! 5. RANDOM BONUS: I will also send out two free postcards to anyone who guesses the correct country that rings in at #500! I'm not sending out any more Postcrossing cards until the 500th is registered, so these are the final 17 countries that are possibilities for this milestone. If the random winner of the larger 5-postcard giveaway also guesses the correct country, a secondary winner will be chosen for this smaller bonus... so this giveaway really has two winners. To clarify, though - to win the larger, 5-postcard giveaway, you don't have to have a correct country guess or even a country guess - everyone who comments on this post (and gets through my rigorous selection process in #2, ha!) will be entered for that prize. But you might as well guess a country, because that will give you two chances to win. Good luck! Let the giveaway begin! So great giveaway! I already left a comment under the last post, but I'll say Belgium again. Congratulations! I want to enter. And I'm going to have to say Finland. 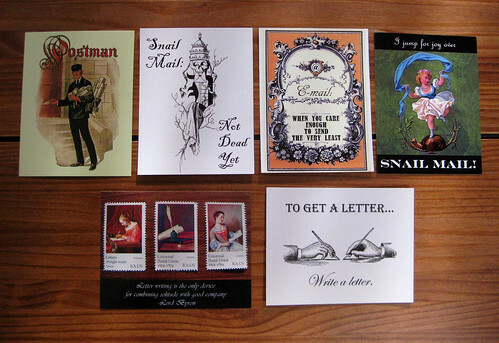 Oh boy Missive Maven postcards! What a great idea. My country guess is Belgium in honor of Hercule Poirot, one of my favorite mystery characters. Thanks Ilona!! I guessed the UK and sticking with it. Otherwise, I hope the hurricane doesn't effect you. i'd love to win these postcards!! they're awesome! my country guess is russia. fingers crossed now!! thanks ilona! Awww, what a nice giveaway! I'm going to guess Germany here. :) Thank you! My country guess is Germany. I'm going to say Belarus. I thought about it the other day and that's the one I still think it might be. Giveaways are always fun, especially on my favorite blogs! (^o^) I'll guess Russia for #500 since it's been traveling for 24 days. 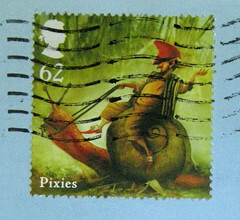 You introduced me to Postcrossing and, though I only started a couple of months ago, I love it. Love to win some of your cards too. I'm guessing Poland. What a cool contest, and awesome postcards. Thanks for the giveaway opportunity. (Although this is my first time posting a comment on your blog, I've been reading it for awhile!). My country guess is Finland, and my email is alegna101 at gmail. Awesome cards! I am guessing that the UK will get it. Then again..we could all be in for a shock when China becomes card 500! OK, I can't resist -- I am guess Thailand since no one else did....and I like Thai food -- reason enough, don't you think? Congrats on (almost) reaching 500 and be safe. Oooo... How exciting!! I think my guess for the country is going to be Finland! Can't wait to see what country it's going to be! I'll say Canada - I have lots of good friends there. The Missive Maven has become one of my daily reads and a link to a lot of other blogs. I'd really love one of your postcards - hope you got mine. Hey, this is a nice giveaway. My guess for the country is the Czech Republic. Thanks a lot! and congrats for the 500! That is a nice giveaway. I will say Russia just to say a guess. Anyhow, congrats on the 500. That is a lot of postcards. Best, and keep on blogging. Great giveaway!! I am staying with the Netherlands. Hello! My guess is the USA. This is indeed a fun giveaway! Thank you! 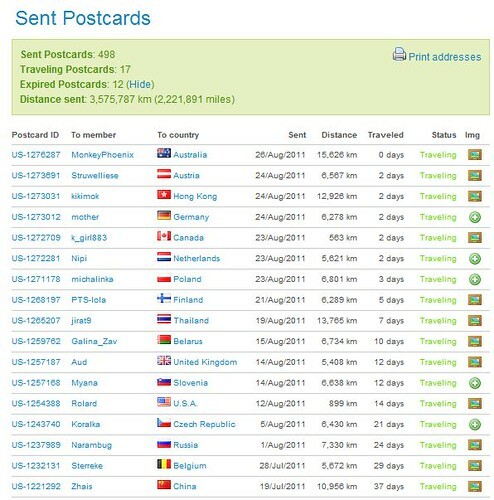 I got one of my new coworkers interested in Postcrossing and she was online yesterday at lunch time, browsing the received cards. She called over to me, "Look at this cool postcard!" I can see her computer from my desk but I'm way too far away to read the details, but the image stood out. I said, "Is that from MissiveMaven to Rolard?" And she looked at me like I must be from another planet. "How the hell did you know that!?" (she can see my computer and could see I was not looking at Postcrossing). It was indeed, so I asked her to click over to MissiveMaven's profiles to see if I guessed correctly and Rolard was #500, but, alas, he is one shy. I haven't looked at Postcrossing yet today. Hoping MissiveMaven has all hatches battened down and is riding out Hurricane Irene nice and cozy. I just LOVE this blog. It could be nice to get the prize, wow! Thank you for your giveaway! I'm with Poland this time. Great giveaway you're doing here. :) I'm going to guess Finland as well. Whoo hoo! I love your postcards! I'd guess that Germany is going to be your 500th card. 500! Blimey, I'm at about half of that. I am pretty sure that my email is in the about section of my profile; otherwise it links to my web site which has a contact form. Hmm, I want to guess Belarus as the 500th sent. Good luck to all! I'm a new reader, but love your blog. 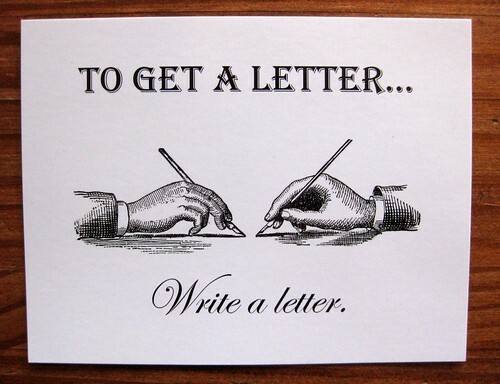 I wish I could write as many letters as you do! My guess is Germany for #500! Congrats! Such an achievement! I'll guess Spain. Oh how fun - it's exciting to hit a postcrossing milestone! :) i'm going to say that Belarus will do the honor of getting you to 500. New R by Rhodia tablet: my new favorite paper! AMAZING writing bat postcard from Carroll!